This volume sets out in search of what we call `Confucian HRM' in Greater China and beyond. It covers theory and practice not only in the People's Republic of China but also in the Overseas Chinese (Nanyang) Diaspora, namely in Hong Kong and Taiwan, among others. It will seek to understand how far traditional Chinese culture and values continue to influence the degree to which the human resource management (HRM) as adopted in those cultural contexts has been implemented. Confucian HRM in Greater China includes a wide range of concepts such as Confucian HRM, employee participation, family firms, `guanxi', learning and job satisfaction, local labour markets, performance-based pay, training policies, and women's roles in employment. 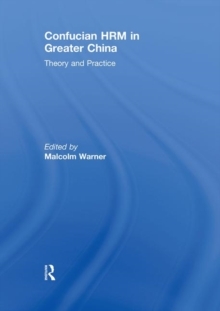 A wide range of international contributors provide the reader with diverse theories, methodologies and perspectives, arguing that the continuity of traditional Chinese values is indeed still empirically observable in the contemporary practice of people-management in Greater China. The contributors are all experts in their fields who teach and research on HRM in many faculties throughout the world. This book was originally published as a special issue of The International Journal of Human Resource Management.